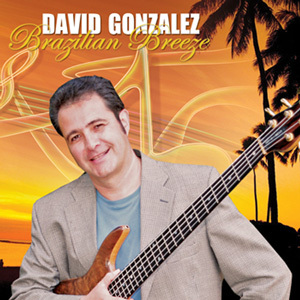 From the clear skies of Ipanema, to the romantic nights in Rio de Janeiro, David Gonzalez’ Brazilian Breeze takes you on an interesting and refreshing musical journey. Brazilian Breeze is a combination of instrumental sounds that brings out a feeling of joy through innovative melodies, with influences from Bossa Nova and Samba. This wonderful music project has been inspired by some of the best in the highly recognized Brazilian style of music, among others, the incredible and dearly missed Antonio Carlos Jobim. David Gonzalez was born and raised in Mexico City, Mexico. David has been a non-stop working musician for over 31 years, inspired by greats such as Jaco Pastorious, Quincy Jones, Antonio Carlos Jobim among others. As a Writer/Producer/Musician, David worked on recording projects ranging from Latin, R&B, Jazz, and Industrial Projects to Jingles, Soundtracks, Voice Overs and Children’s Music.